This free, printable business plan outlines key strategies and market development for starting up a resort cabin and competing against other camping and vacation spas in the market. The long-term goal of COMPANY NAME is to offer temporary lodging, hunting, and vacationers get-away from all of the hustle and bustle of everyday life. COMPANY NAME specializes in personalized service, the historical nature of [CITY], Mo, and its unique location is one of the most attractive parts of [CITY]. We plan to be more than a great lodging, hunting, and vacationer's paradise. We plan to create an environment of leisure that surpasses the standard fare for [CITY] and [CITY]. Expanding our exposure via the Internet and introducing [CITY] and [CITY] to people that have not yet discovered this year-round paradise will allow us to maintain a higher than average occupancy rate and above average profits. COMPANY NAME is located in [CITY], [MISSOURI]. COMPANY NAME is just an hour away from [CITY, [STATE] a vacationer has limitless vacationing option to please their palette. COMPANY NAME is an established Motel Cabin, hunting resort, and has been in operation for the last six years. After taking possession and a brief period of getting established, we added a Ranch house to ensure a steady flow of patrons (hunters, tourists and locals) through its doors. The last owner purchased the property four years ago, and he wasn't operating the business at full capacity. The grounds were poorly maintained and were in need of renovating. This summer we plan on adding two new cabins, renovate current cabins, and add a play area for families with children. 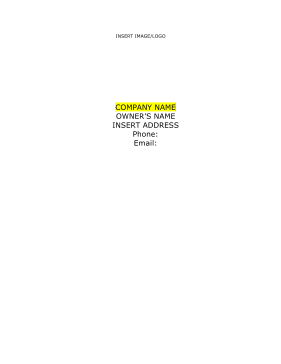 COMPANY NAME is a non-profit corporation under the INSERT NAME. COMPANY NAME was originally built in 2006. Each of our rooms is equipped with two double beds or a queen bed, and rooms with a second bedroom or kitchenette are available. The Ranch house also has on-site front desk service. A few of the buildings are currently being renovated with plans to complete and build two more cabins. As the Ranch house gains recognition during the peak season, we plan to expand our services to the residents of [CITY] and surrounding cities in time for the off-season. The large dance floor area is ideal for formal or informal gatherings (e.g. wedding receptions, club meetings, Christmas parties, family reunions, etc.). COMPANY NAME target market strategy is based on becoming a destination of choice for people searching for a rustic place to relax or recharge. The target markets that we are going to pursue are people or families looking for a vacation destination, honeymooners, family reunions, hunters, and drop-in customers. Our country style setting and facilities are a natural choice for hunters or families to visit, what with the having so many outdoor things to do. Our three major customer segments are tourists, locals, and hunters from all over the United States. Since the [CITY] area is known for great hunting of elk and deer, and local patrons who need the facilities for various events. Subscriptions to various Web services will provide local and international exposure to potential customers for a nominal annual fees, plus we have a website www.COMPANY NAME.com The Ranch house would like to see a 30% increase in customers on a yearly basis for formal or informal gatherings (e.g. wedding receptions, club meetings, Christmas parties, family reunions, etc.). COMPANY NAME will be acquired via a business grant with the new owner supplying and initial investment of 10% down. We are assuming an initial capital start-up, as shown in the Start-up table, for operating expenses which we have already contributed. We estimate average monthly fixed costs, including operating expenses, as presented in the Financial Plan chapter below. Our peak and off-season traffic is fairly consistent and will not have a major impact on the monthly earnings as long as we maintain a 60% occupancy rate. As COMPANY NAME builds its market position among the local patrons, we anticipate that off-season revenues will be enough to break even during that season.